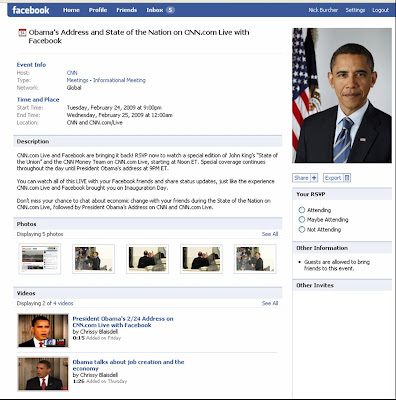 CNN and Facebook combined to bring 'social coverage' of President Obama's Inauguration Speech. This was deemed a runaway success with CNN.com serving 13.9 million video streams globally with 600,000 Facebook updates made through the CNN Facebook window. CNN and Facebook are now combining to bring social coverage of President Obama's State of the Nation address on Tuesday 24th February - online viewers will again be able to watch the live stream from CNN, whilst updating their Facebook status through a Facebook window on the same page. "CNN.com Live and Facebook are bringing it back! RSVP now to watch a special edition of John King’s “State of the Union” and the CNN Money Team on CNN.com Live, starting at Noon ET. Special coverage continues throughout the day until President Obama's address at 9PM ET. You can watch all of this LIVE with your Facebook friends and share status updates, just like the experience CNN.com Live and Facebook brought you on Inauguration Day. Don’t miss your chance to chat about economic change with your friends during the State of the Nation on CNN.com Live, followed by President Obama’s Address on CNN and CNN.com Live." It will be interesting to see how the numbers compare with the Inauguration coverage - will an evening event deliver the online viewer numbers to the same extent that the daytime Inauguration speech did? Social TV - does the Inauguration coverage mark a watershed moment? Nick, What do you make of CNN's Time-Warner owning Bebo, Bebo having visibility with broadcast/advertisers, and yet not being used in any way for such TW subsidiary integration?